Eligibility Criteria: The promotion is open to members of Priority who are UK residents age 16+. Offer Start and End Dates: Offer is valid from 02/01/19 - 20/01/19. Redemption Instructions: To redeem, tap ‘Use now’ and you will be directed to the Protein World website. Enter your code at checkout to apply the discount. Offer Goods/Services: This offer entitles you to receive 45% off online. 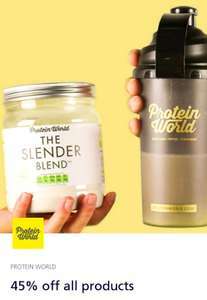 Offer is valid on all items at proteinworld.com. Cannot be used in conjunction with any other offer. Only one voucher code can be entered and redeemed per order. Availability: While stocks last.